The Golden Raspberry Award Foundation tonight announced the Razzie Awards winners and Josh Trank’s Fantastic Four received three. The film, which earned $168 million worldwide on a budget of $120 million, “won” for Worst Picture (sharing the award with Fifty Shades of Grey), Worst Remake/Rip-Off/Sequel, and Worst Director. You can check out the full list of winners at ComingSoon.net. The Josh Trank directed film stars Whiplash‘s Miles Teller as Reed Richards (Mr. Fantastic), “House of Cards” star Kate Mara as Sue Storm (The Invisible Woman), Fruitvale Station and Chronicle‘s Michael B. Jordan as Johnny Storm (The Human Torch) and The Adventures of Tintin‘s Jamie Bell as Ben Grimm (The Thing) alongside Reg E. Cathey (“The Wire”) as Dr. Franklin Storm, and Tim Blake Nelson (O Brother, Where Art Thou?) as Harvey Elder, aka The Mole Man. An origin story said to be inspired largely by the “Ultimate Fantastic Four” comics, Fantastic Four offers a contemporary re-imagining of Marvel’s original and longest-running superhero team. The story centers on four young outsiders who teleport to an alternate and dangerous universe, which alters their physical form in shocking ways. Their lives irrevocably upended, the team must learn to harness their daunting new abilities and work together to save Earth from a former friend turned enemy. 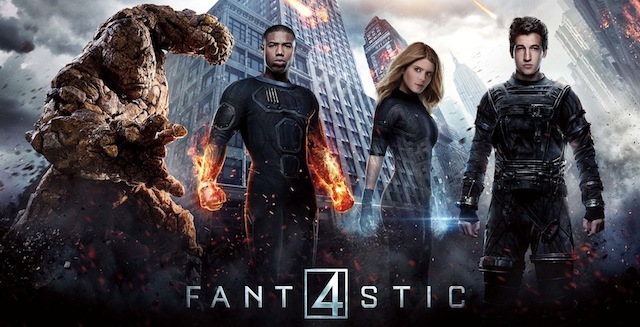 Fantastic Four features a screenplay by Simon Kinberg (X-Men: Days of Future Past), who is also a producer on the film.